Chicago is well known for having the best Italian beef and deep dish pizza in the world. 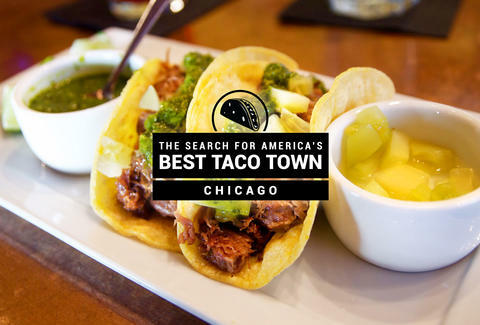 But, even with a massive Mexican-born population and hundreds of taquerias across the city, Chicago is less well known as America’s top taco town. Okay, not at all known. But here's the thing: it totally should be. So, head down to the corner taqueria, order up some tacos al pastor, and familiarize yourself with our case below while you wait. Chicago’s reputation as the Second City doesn’t just stem from its rivalry with New York. 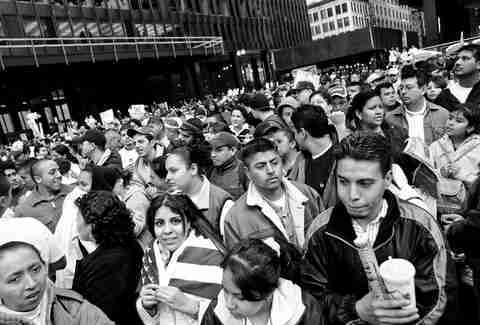 Chicago is also the second city when it comes to Mexican migration to the United States, with 677,000 Mexican-born immigrants giving it the second-largest Mexican-born population in the country outside of LA. While this is no surprise to anyone with even a cursory familiarity with many of the city’s Southwest and Northwest Side neighborhoods, it totally IS a surprise to everyone outside the city. And with this proud second place title come the authentic recipes, experience, and dedication it takes to make the perfect taco amidst hundreds of taquerias in storefronts, trucks, supermercados, and stands across the city. You're never far away from a warm pack of just-made tortillas in Chicago. The city itself boasts a number of tortillerias that deliver their product across the city (and the world), including the world-famous El Milagro. Even spots in DF (that’s Mexico City, or Distrito Federal) use these local factories. Yup, tacos in Mexico are made with Chicago tortillas. If you've always wanted to go to a major metropolis in Mexico but haven’t had the chance, you don’t need a passport to do so. Just head over to the corner of Polk and Des Plaines to experience one of Chicago's oldest running markets. Originally a haven for the city's Jewish population, in the last few decades it's shifted Mexican, and with that shift comes all sorts of amazing street food that makes Mexican one of the most popular cuisines in the country. 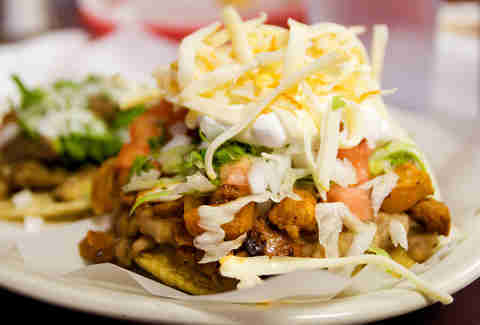 Try the crowd favorite tacos al pastor from Rubi's, if you know what’s good for you. Chicago’s reputation as a steakhouse town also rubs off on its neighborhood taquerias, where the steak taco is king. And while the carne asada taco isn’t a Chicago invention, we may have well perfected it thanks to our obsession with beef. You're never far away from char-grilled skirt steak that is so expertly cooked and pairs so well with the classic flavors of a corn tortilla, salsa verde, and onion/cilantro, you’d think you were in Mexico after bite No. 1. Aside from the hundreds upon hundreds of real-deal taquerias, Chicago also boasts an insane (and insanely fast-growing) number of modern taco shops. Big Star may be the most well known driver of the recent trend, but don’t stop at the foot of its patio. Whether you're indulging in the chef-driven recipes of Antique Taco or the fresh flavors of Takito Kitchen, there's always another new upscale taco joint (from Authentaco to Kokopelli) demanding a return visit. 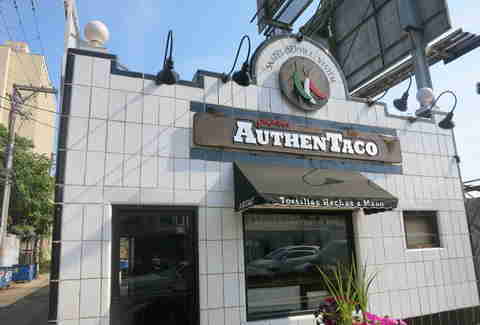 Maybe the reason Chicago is so overlooked is because so many of the finest taco shops can be found in neighborhoods that are less traveled. Pilsen and Little Village are always the first neighborhoods mentioned with a heavy Latino presence, but places like Gage Park, Rogers Park, and large areas of the West and East sides boast countless taco options that can be found with little to no effort or exploration. It takes a little bit of dedication, but if you want to experience the hyper-authentic taco offerings commonly found in different Mexican states, you can find most of them in Chicago. We'll even give you a trio to get started. 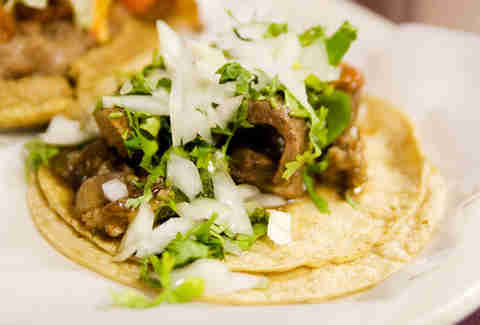 Try real deal DF-style tacos al pastor (cut directly off the spit) at Taqueria Los Barrilltos in Little Village. 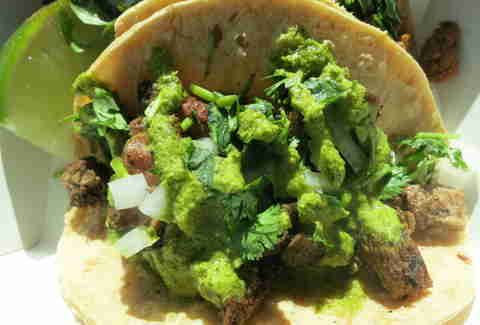 Hit Mom's Old Recipe Mexican Restaurant in Gladstone Park to try tacos acorazados, a specialty from Cuernavaca. 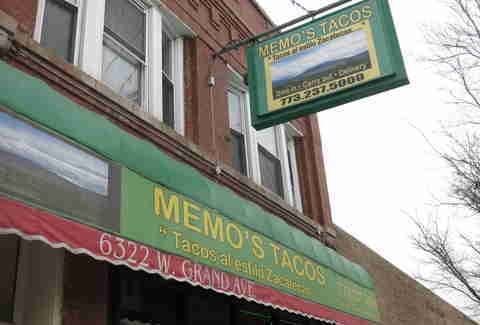 And to be transported straight to the Baja Peninsula, head to El Metro in Ukrainian Village for a fish taco. It doesn't matter if you want one at the crack of dawn or immediately after last call, it’s never too late for a quality taco or two. 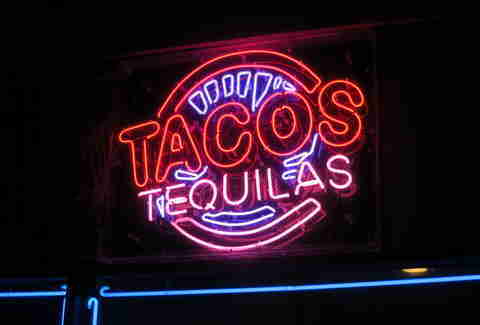 Whether in the form of post-close late-night spots or the hundreds of supermercados, or even the not-supposed-to-be-there taco trucks, you will never be too far from a tasty remedy to the taco craves. And for when you’re too lazy to leave the bar for your fix, there’s always the Tamale Guy. Like the jerk taco. Asian fusion tacos are so yesterday. 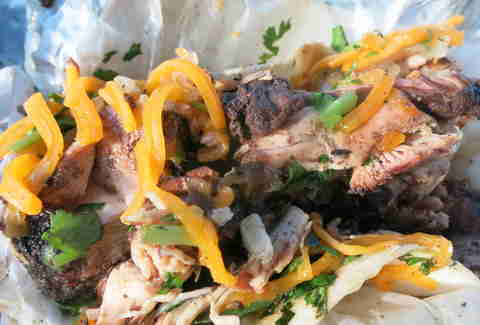 Chicago's great (yet still largely unknown) food trend is the jerk taco. Started by the appropriately named Jerk Taco Man, and a staple of the West Side, these spicy treats can now be found all over both the South and West Sides. While the match of spicy smokey jerk chicken with cooling onions and cilantro is expertly done across the city, we still think the loaded version from the original are the best. Find 'em at 604 N Cicero. 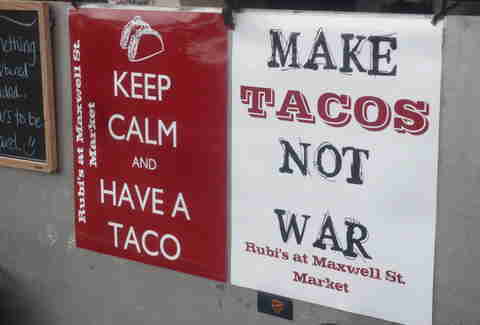 Titus Ruscitti is a contributing writer for Thrillist and the man behind Chicago Taco Tour. You can join him on his taco-specific travels throughout the cityscape there, or his general food ones on his blog, where he's single-handedly tackled close to 1,000 food stops. Follow him @chibbqking.